Get Excited To Learn About God! I'm so happy to have a voracious reader! When the UPS man brought this book to our door, you can bet he was reading it soon after we opened the package. This latest resource brings all of my son's favorite Bible stories to life with a new (and tasteful) twist! Totally Awesome, Super-Cool Bible Stories (as drawn by Nerdy Ned) combines International Children's Bible text with stories and sketches to provide kids a fun walk through the Bible. My son (age 7) has loved this, and my daughter (age 11) has been sneaking a peak at it, too! With chapter titles like "Sibling Rivalry: Extreme Edition" (Joseph and his brother) and "Jesus Walks on Water? Rad! ", this is sure to keep kids (especially boys) engaged. The book contains 40 Old Testament stories and 47 New Testament stories, there is a lot of reading material. 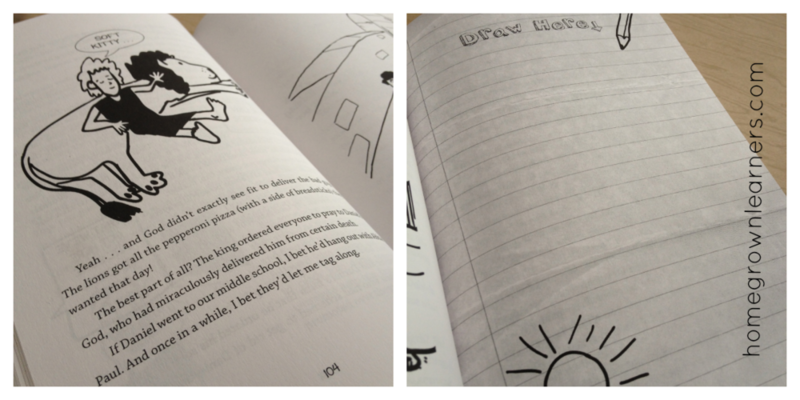 Throughout the book, there are also several "Draw Here" pages that encourage your child to be an artist like the author, Nerdy Ned. I'm always cautious about Bible story books for children, because I want to be sure my children are getting the REAL story from their regular Bible. I was impressed, however, with the accuracy of these stories, and the engaging format. As my children get older I'm learning that you have to meet them where they are, and Nerdy Ned has certainly done that. This is a welcome addition to our Bible studies, and just a FUN book that allows my son to be creative with drawing. Totally Awesome, Super-Cool Bible Stories is available from Thomas Nelson for $12.99. I'm thinking it might make a pretty nice Christmas gift for upper elementary or middle grade kids! Tommy Nelson is giving away a copy to one lucky reader. To enter, simply leave me a comment telling me if your child has ever drawn anything inspired by a Bible story. This giveaway will be open until December 9th at midnight. Disclaimer: I received the above named product from Tommy Nelson Publishing in return for my honest review. I have not been compensated in any other form. I am a proud Tommy Nelson Mommy!